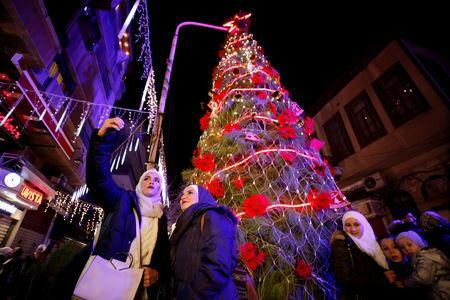 DAMASCUS (Reuters) - Christmas decorations are going up for the first time in years in a Damascus neighborhood that was a frontline in Syria's war until government forces wiped out the last rebel enclaves in the capital earlier this year. "Last year we didn't dare to walk in the streets a lot," said Abir Ismail, a resident of al-Qasaa neighborhood, adjacent to Jobar town that was controlled by an armed faction. "We had no electricity and there were no lights or decorations," she added, expressing excitement at the sight of the decorated streets and houses this year.